Bermuda-based participants, including students as young as 12, worked individually and in teams to develop ideas. On the final afternoon of the two-day event, they presented their work to a judging panel of local fishery experts, computer programmers, and sponsors. Bermuda’s first place winner was Jonathan Barker, a software engineer at Endurance. His project will go on to compete in the global Fishackathon competition that has a grand prize of a $20,000 grant to develop the winning computer app design. His app would enable the user, based on geographical location, to access information on Bermuda’s fishing rules and regulations, including the coordinates of the island’s marine protected areas. 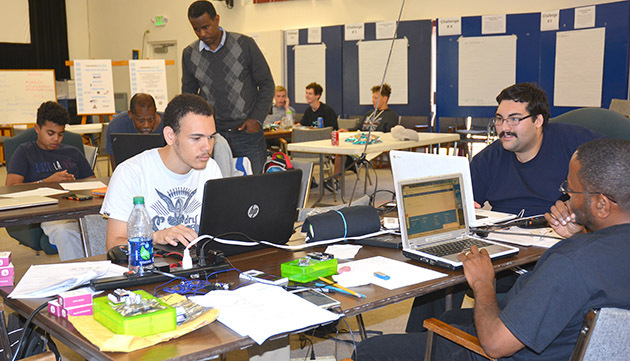 “Those who participated displayed innovation, tenacity, and dedication, and proved that coders in Bermuda can hold their own on the international stage,” said U.S. Consul General to Bermuda Mary Ellen Koenig, who spearheaded the event. BIOS president and CEO William Curry was among the five judges. JP Skinner, Director of Ocean Academy at BIOS, provided technical expertise.